Increasing customer engagement is just one reason firms like yours choose us to help develop cashback browser add-ons. Unlike many other solutions that exist on the market, we will provide you with full source code of your solution, so you’ll keep your destiny in your hands. We request no royalties or any recurring fees, you pay only for development. Strong code base and cross-browser framework significantly reduces project timeframe. This allows you to release your extension to the market earlier, and sooner start generating revenue. Our team incorporates strong backend developers. We can set up the API to let add-on interact with your database, to free your team’s hands and allow you to focus on other tasks like building relationships with affiliate networks and business development. Live cashback notifications reminds your users that they will get cashback at the exact time they visit the merchant website. The live cashback notification makes it quick and easy for the user to enable the cashback affiliate link with the click of a button on the slider, helping to increase the conversion rate. There’re billions of web searches conducted every month. Our solutions ensures that your brand is continually promoted as your users keep searching on the web. Search results page injection means your icon will be displayed next to relevant listings on major search engines such as Google. 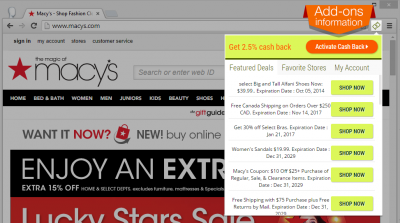 This immediately alerts the user that they can get cashback from you for purchasing on these sites. 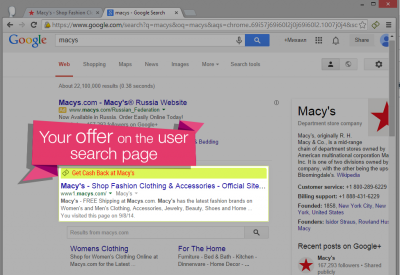 Studies show that icons next to search results help users to make a decision regarding merchant choice much quicker. The injection can also display messages, telling the user how much of a cashback they can get from the merchant. You can display information from your user’s profile in a menu pop-up of the browser add-on. It can be the amount of cashback earned so far. Or a list of special deals available right now. You also can use this area to display dynamic notifications to your user. While you can deploy your add-ons to official browser web stores, we can build a single installer which makes distribution of your add-on even easier. Our research has shown that a single installer increases both user take up levels and user engagement with your coupons. With a single installer, the user runs a single .exe file to install the add-on across all major browser platforms (Chrome, Internet Explorer, Firefox, Safari, Opera) available on the user’s computer. Minimal interaction is required by the user. Having the single installer, you can bundle it with some third party software to distribute the add-on. Our statistics shows that audience coverage is increased by an average of 72% – 95% when browser add on development includes cross-browser publication. This makes a single all-browser installer a very powerful tool that can be used to increase your add-ons success from day one.